Photographing or recording this performance without permission is prohibited. Kindly disable pagers, cellular phones, and other audible devices. Although rare, all dates, times, artists, programs, and prices are subject to change. The concert begins. The music is sublime. Not even a pin would dare drop. Suddenly, a cellphone rings and the madness starts. The pianist loses his hand. The violinist, while tuning, falls asleep, and later wakes up in the middle of a motorway, transformed into a “Riverdancer.” When the pianist returns, the piano is locked, telling him to insert his credit card. He just talks on the phone while reading a paper, eating, and playing the piano upside down all at the same time. These and many other “nightmares” unfold before audiences’ eyes and ears. 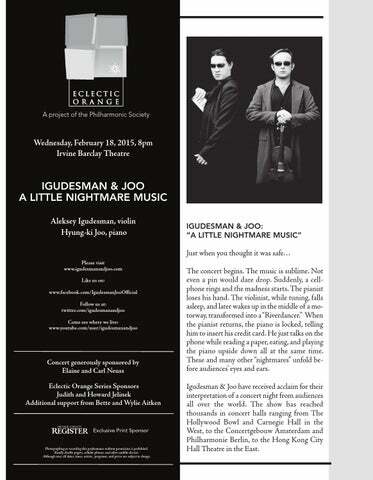 Igudesman & Joo have received acclaim for their interpretation of a concert night from audiences all over the world. The show has reached thousands in concert halls ranging from The Hollywood Bowl and Carnegie Hall in the West, to the Concertgebouw Amsterdam and Philharmonie Berlin, to the Hong Kong City Hall Theatre in the East. 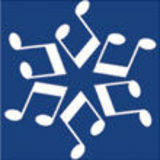 “A Little Nightmare Music” is a unique show, full of virtuosity, enchanting music and zany, outrageous humor. Ideal for audiences aged 8 to 88, this show is sure to captivate you and crack you up whether you’re a classical music enthusiast or the type who runs for cover, at the mere mention of Mozart. On New Year’s Eve 2011, at the Vienna Konzerthaus, with the help of 100 violinists from all over the world, Igudesman & Joo set the world record for the most “Dancing Violinists” performing together on stage. The world record was conceived and produced by the duo in aid of UNICEF. Aleksey Igudesman and Hyung-ki Joo are two classical musicians who have taken the world by storm with their unique and hilarious theatrical shows, which combine comedy with classical music and popular culture. Their clips on YouTube, to date, have gathered more than 28 million hits, and the duo has appeared on television in numerous countries. Equally comfortable performing in classical concert halls as well as in stadiums in front of crowds of 18,000, their collective dream is to make classical music accessible to a wider and younger audience. Aleksey Igudesman was born in Leningrad at a very young age. He has never won any competitions, mainly because he has never entered any. During his studies at the prestigious Yehudi Menuhin School, he read the entire plays of Bernhard Shaw, Oscar Wilde, and Anton Chekhov, which didn’t improve his violin playing, but made him feel foolishly somewhat superior to other less intellectually endowed, yet harder practicing colleagues. After studying with Boris Kuschnir at the Vienna Conservatoire and being told many times by many people that they were rather worried about his future, he embarked on a successful career playing, composing, arranging, recording several CD’s for BMG, and working in Hollywood with Academy Award®-winner Hans Zimmer. Aleksey Igudesman writes a lot of music. Often he goes to bed writing and gets up writing. He sometimes feels a little insecure about his music, although it is published by Universal Edition. In fact, his psychiatrist tells him that he is insecure about a lot of things. Aleksey is not so sure about that. Aleksey Igudesman plays with a bow made by the Boston-based bowmaker, Benoit Roland, and on a Santo Seraphin violin from the year 1717, which is kindly loaned to him by ERSTE BANK. Hyung-ki has small hands, (but only hands small), and therefore finds some piano repertoire quite difficult to play. Anyway, even with this small hindrance, he happily performs chamber music, recitals, concertos, his own compositions, and anything else that includes a piano part. Besides composing, performing, laughing, brushing his teeth at breakneck speed, and writing comedy, Joo’s passion for teaching has led him to develop his own personal style of workshops.